Representative Indians, is the reprint of the 2nd edition of this Popular book published in 1897. 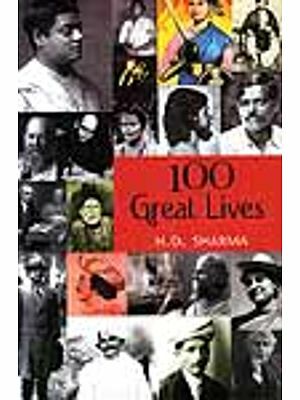 It is a collection of facinating biographies of many of the leading men of the nineteenth century who played a key role in making India a more progressive and forward a more progressive and forward looking country. These men were impressed in particular by modern science and the doctrines of reason and humanism. Besides, they shared the common belief that social and religious reforms were urgently needed. In a sense this books is a retelling of the history of India in the nineteenth century –a century marked by significant milestones like the Mutiny, extinction of the East India Company and direct control of India by Her Majesty, the Queen of England, social reforms like the abolition of Sati and child remarriage, the Widow Remarriage Act, formation of the Indian National Congress etc. G.Paramaswaran Pillai (1864-1903) was a political activist, journalist and an accomplished writer and editor of Madras Standard. GP founded the Madras Social Reform Association and was a prominent temperance worker under Madras Temperance League. The well-Known books published by him include London and Paris through Indian Spectacles (1896) and Indian Congressmen, containing brilliant pen-pictures of leading Congressmen of his time. GP went to England in 1899 to qualify for the Bar and returned to India in 1902 as a Barrister. He passed away in 1903 at the young age of 39 years. "what is history but a patchwork quilt of biography, and the dividing line often a smudgy one?" so asked Alistair Home in his book Introduction to Telling Lives-from W.B. Yeats to Bruce Chatwin. Avery apt observation, one would agree. A collection of biographies sometimes can give us glimpses into the remote crevices of history that may often get left out in the books of history. Representative Indians is a collection of biographies of men who lived remarkable lives in the India of the nineteenth century. As we progress through the pages, many forgotten names, places and incidents are called to mind. Indeed, in some case, the reader may be pleasantly (or otherwise) surprised at happenings that seem to echo incidents of the recent past. Shri G.P. Pillai has diligently selected great men happening. So, in a sense, the book is a retelling of the Mutiny, extinction of the East India Company resulting in India being placed under the direct authority and control of Her Majesty the Queen, social reforms like the abolition of Sati and child marriage, the natives, economic issues like the cotton crisis and the exploitation of the indigo farmers, political awakening marked by the formation of the Bombay Association, Madras Native Association, Indian National Congress and similar associations, birth of diverse movements, political, social and religious, it was indeed an exciting time to be born and living in India, being a witness to the new awakening which marked the beginning of the momentous happenings of the twentieth century. Biography in India From the earliest times of the gurushishya parampara the pupils sang narratives about the eventful lives of their preceptors. They abounded in exaggerated incidents and supernatural elements. These hagiographies may be the earliest examples of recounting lives in India. They were in verse and were passed on from generation to generation through oral tradition. Later they took the written form. The principal subjects were saints and religious teachers. Still later, detailed accounts of the lives and exploits of the rulers were sung by courtiers and wandering mendicants. Some earliest examples of biographical verses in Indian languages are – Buddhacharita by Asvaghosha and Harshacharita by Bana in Sanskrit, Chaitanya Bhagavata by Vrindavan Das in Bengali, long poems in Kashmiri commemorating the lives of Prophet Muhammad and his relatives, Janam Sakhis, anecdotal details of the life of Guru Nanak Dev, in Punjabi, etc. There were also works in prose on the lives of Christ and St Francis Xavier in Goa, in Konkani. It was in the nineteenth century that, under the influence of Western literature, biography writing evolved in all major Indian languages, Subjects now came to be chosen from fields other than religious, like cultural, social and political. A large number of biographies were published in Bengali, Prominent among them being Raja Partapaditya Charitra by Ramram Basu (1801) and Jivan Charitra by Isvar Chander Vidyasagar (1849). Anandaram Dhekiyal Phukanar jivan Charita by Gunaviram Barua in Assamese had a leading literary figure as subject. Strangely, one of the earliest biographies in Tamil was Lord Clive by Katirvelu Pillai (1871). Telugu saw the publication of Andhra Kavulu Charitamu that may be the first biographical notes from Mander's Treasury of Great Men were translated into Malayalam by Maharaja Visakham Thirunal of Travancore and were published in the journal Vidyavilasom (1875). This was followed in 1895 by Mahatcharita Sangraham by Kerala Verala Valia Koyi Thampuran. Gujarati saw the publication of Kavicharita and Mahapurushanam Charitam by Narmad (1865 and 1870). Interestingly, British Government, with a critical interest in Sikh history, sponsored writers like Lala Sharda Ram Phillauri (1837-1881) who wrote Sikhon de Raj de Vithya. In Sindhi, Mirza Qualich (1853-1929) wrote Ahivalu Shah Abdul Latif Bhitai about a Sufi mystic poet. Several biographies were published in English too, Biographical Sketches of the Dekkhan Poets by Kaveri Venkata Ramaswamy (1829), The Life and Teachings of Keshubchunder Sen by P.C. Majumdar (1851), Lights and Shades of the East by Framji Bamanji (1863) and Biographical Sketches of the Rajas of Venkatgiri by T. Rama Rao (1875) were some of them. The names and memories of great men have been aptly described to be "a dowry of a nation", and the people of India have reason to be proud of their own dowry. But it may be asked whether the men whose lives are told in the following pages can be reckoned great. They are, perhaps, not absolutely great – great in the sense in which the heroes of the world – great in the sense in which the heroes of the world are deemed great, but their relative greatness is unquestionable. Emerson thinks he is a great man "who inhabits a higher sphere of thought, into which other men rise with labour and difficulty; he has but to open his eyes to see things in a true light, whilst they must make painful corrections, and keep a vigilant eye on many sources of error". According to Beaconsfield, one who affects the mind of his generation is a great man. In either of these senses the men whose lives are embodied in this volume may be deemed great. However, whether great or not, they are the best products of that happy welding of the keen intellect of the East with the sturdy self-reliance and energy of the West. All of them lived and died in the nineteenth century, though two were born in the latter portion of the eighteenth. They are the best representatives of a new type of men, who have been brought into existence in India since the growth of British power in that land. Among India's great men there have been statesmen, philanthropists, jurists, educationists, archaeologists, scholars, religious, social and political reformers, journalists and those who have promoted indigenous industries. But, while representatives of some of these classes may be found in all Presidencies in India, It is worthy of note that different presidencies have conducive to the growth of different types of men. While Madras has been the nursery of statesmen, Bombay has been well known for its philanthropy, and Bengal has been the birthplace of leaders of large movements, mainly religious. There is ample proof to show that these Presidencies still retain their peculiar character. Madras still supplies the Native States of Baroda of Philanthropists is on the increase; in Bombay, the number of philanthropists is on the increase; and in Bengal, a new religious lender has arisen. Sir Salar Jung, Sir Dinkar Rao, Sir Madava Rao Ramiengar and Runga Charlu represent the highest types of native statesmanship in India. In his India in 1880, Sir Richard Temple says, "A class of native statesmen is raised up who have a better chance of showing originality of talent and force of character than they could possibly have in the territories administered directly by the British Government. Thus the ruling race acquires a far better idea than it could otherwise have had regarding the development of which native ability is susceptible, and the part which natives can fill when thrown on their own resources. Many native statesmen have been produced of whom the Indian nation may justly be proud, "Among these, he mentions sir Sir Salar Jung, of Hyderabad, sir Dinkar Rao , of Gwalior, and Sir Madava Rao, of Baroda. There is no doubt that these were the three best known statesmen in India, the reputation of the other two being Confined to the Presidency of Madras. According to one European authority, Sir Madava Rao belonged to the intellectual type of Purnia of Mysore, and was, "in point of character and directness, greatly the superior of Wellesley's typical Brahmin Minister"; another authority considers "as a man of business, especially in finance, Sir Salar Jung has not been surpassed by any native of India in this century, though as an administrator he was not superior, and was even considered hardly equal to "Sir Dinkar Rao and Sir Madava Rao; while a third is of the opinion that India is not likely to produces two such men as Sir Salar Jung and Sir Madava Rao more than once in two or three centuries. It is idle to enter into the comparative merits of the five Ministers. There is no doubt that they have left an indelible mark of their individuality on the administration of Hyderabad, Gwalior, Baroda, Masore and Travancore. "Constitute Government how you please," says Burke, "infinitely the greater part of it must depend upon the exercise of powers which are left at large to the prudence and uprightness of Ministers of State. Even all the use and potency of laws depends upon them." The modern history of these Native States bears undoubted testimony to the prudence and uprightness of Ministers of States bears undoubted testimony to the prudence and uprightness of the five Ministers. Among Indian philanthropists none is held in higher esteem than Sir Jamsetji Jijibhai, the first baronet of that name, who set a bright example, not only to his descendants, who have followed in his footsteps, but to the people of India as a whole. He made money, and, what is more difficult, used it to the best advantage of the members of his own family, and the poor and the needy in Bombay and elsewhere. Sir Munguldas Nathubhoy and Gokuldas Tejpal were two other reputed philanthropists in Bombay. Sir Munguldas also took an active interest in social and political reform, and was a member of the Bombay Legislative Council. Dwarkanath Mitter, Sir Muthusawamy Aiyar, Telang and Mandlik were the best jurists in India. 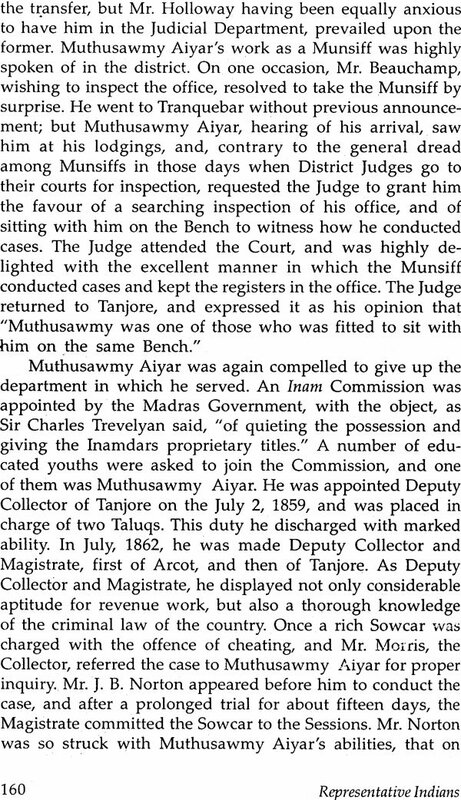 Of these , Mitter, Sir Muthusawmy and Telang were Judges of the High Court of Calcutta, Madras and Bombay respectively. Mitter and Telang died young, after very few yeras' service on the Bench. Besides being a judge, Telang was well-known for the versatility of his powers. 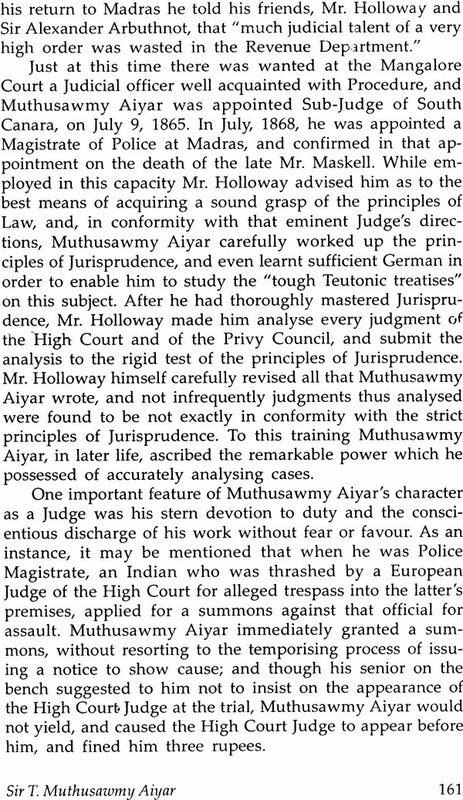 Sir Muthusawmy's talent as a judge was of a very high order. Mandlik was not only a brilliant lawyer, but the author of an important treatise on Hindu Law. Sir Rama Varma, Krishna Mohan Banerji, Runganada Sastri, Rajendra Lal Mitra, Bhau Daji, Runganada Mudaliar, Gopal Rao, Madhu Sudan Dutt and Bankim Chunder Chatterji may be classed among the great Indian scholars. Of these, Rajendra Lal Mitra and Bhau Daji distinguished themselves as archaeologists; Runganada Mudaliar and Gopal Rao as educationists; and Dutt and Chatterji as authors, one of poetical works and the other of prose fiction in Bengali. In scholarship, none excelled Sir Rama varma. Sir Grant Duff considered him "a typical example of hte influence of English thought upon the South Indian mind." Several of these men were well-known for their scholarship not merely in English, but in other languages as well. Runganada Sastri was master of fourteen different languages; Madhu Sudan Dutt knew eleven; and Rajendra Lal Mitra and Banerji knew ten each. The greatest of religious reformers hail from Bengal Rammohan Roy and Keshub Chunder Sen. If the one was the pioneer of religious reform in Bengal, the other was chiefly instrumental in strengthening its foundation. Both were social reformers in the sense in which social reform is understood in India. Both were in the service of the British Government for a while; both visited England, and were enthusiastically received by the people; the one caused the inhuman custom of Sati to be abolished, and the other got the Brahmo Marriage Act Passed.